JR Farmy's is now available in an xxL 4-pack. JR Farm Farmy's GrainleΒ xxL is a perfect snack for all small pets like dwarf rabbits, guinea pigs, rats, hamsters, mice, chinchillas and degus. Even rabbits, guinea pigs and chinchillas actually rarely eat grains in the wild. Farmy's GrainleΒ offers a species-appropriate treat or reward. The stick shape is ideal for hanging from the cage to keep your pet occupied. The sticks are baked into flavours like Daisy-Cornflower, Marigold-Mallow, Sunflower seeds-Chamomile and Wild-Thistle at the JR Farm bakery. They are free from grains to support healthy digestion. The high raw fibre content aids in dental abrasion and prevents dental diseases. The snacks are also made without any added sugar – a healthy snack, completely guilt-free. 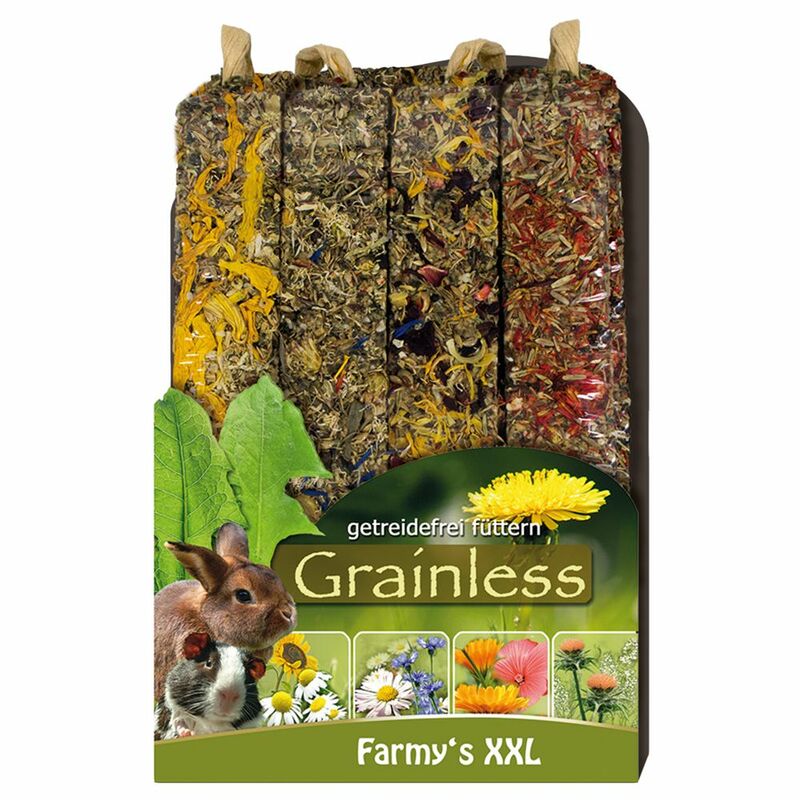 JR Farm Farmy's GrainleΒ xxL at a glance: Supplementary feed for all dwarf rabbits and small pets like guinea pigs, rats, hamsters, mice, chinchillas and degus Contents: 4 x xxL sticks (450g total), each pack contains one stick of each flavour - Daisy-Cornflower, Marigold-Mallow, Sunflower seeds-Chamomile and Wild-Thistle Free from grains and sugar-rich ingredients Entertainment: snack sticks to hang from the cage and keep your pet entertained Baked in the JR Farm bakery.